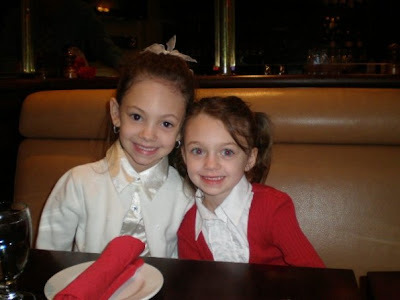 Celebrate New Year's at Cheers! With special guest 1998 and 2002 Olympian, World Relay Champion, Four-Time World Championship Medalist and National Champion Speed Skater Dan Weinstein hosting! The Comedy Club at Cheers... in the Boston Globe! In an article about the Boston comedy club scene in the Boston Globe on Thursday, December 24th, the Comedy Club at Cheers was not overlooked. Click the images to enlarge and read all about it! Looking for adventure? And a delicious meal? Join us for a three course meal, with choice of appetizers and entrees, and a showing of a classic Indiana Jones film. Click the image below to enlarge for the menu and other details. the Hampshire House, 75 Chestnut, and the Frog Pond! 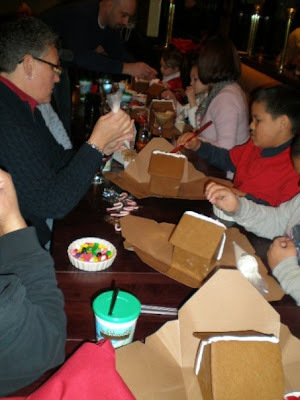 Due to the popularity of our Gingerbread House Party this year, we've added one last date! Space is limited, so please call to reserve a spot! Interested in the Comedy Club at Cheers Faneuil Hall? You can keep track of what's going on through five different online tools! Read what's new on Tumblr! Watch them on You Tube! 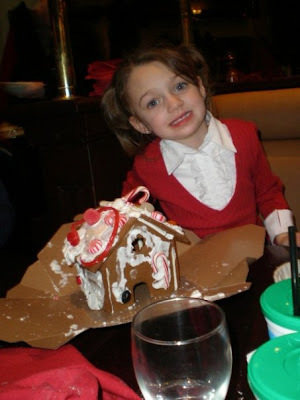 the daughter of Sara Hyatt, who works in HR and Accounting. 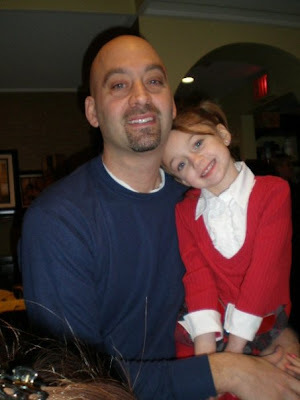 Here's Marc, with one of his daughters. 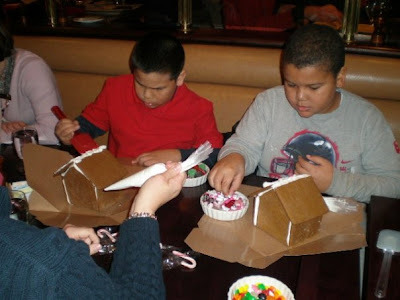 Once the houses were brought out, everyone was hard at work! Looks like Tia is using some Chicklets! it was hard to chose what building materials to use! But first, you need a good layer of icing. 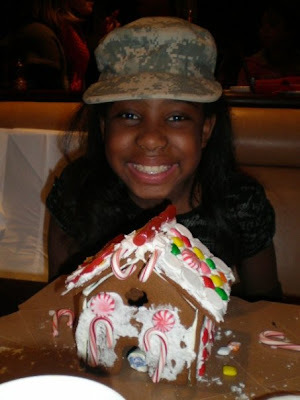 This red and white house seems to match the artist's outfit! and the snowy, gumdrop roof is very festive! Colorful columns held up this house! It must have taken a lot of patience to match those colors. 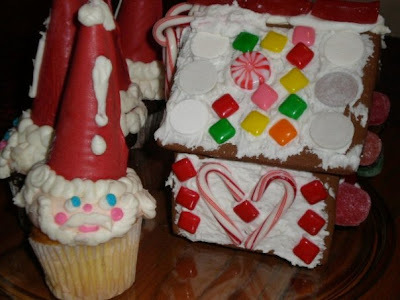 A very clever use of licorice! 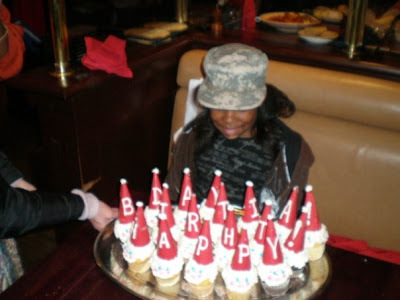 We hope all your birthday wishes came true! 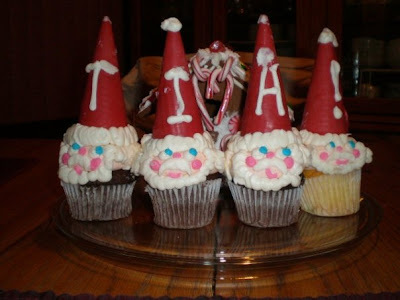 Special thanks to the sister of Michele Giacomozzi, our Catering Sales Director, who decorated these delicious Santa cupcakes! 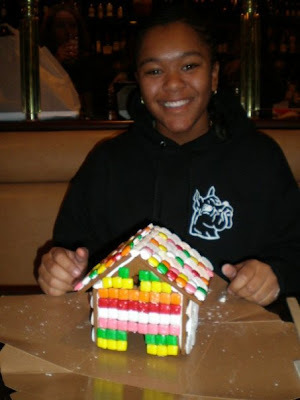 of the completed gingerbread houses. This one stopped to admire a well-crafted peppermint heart! 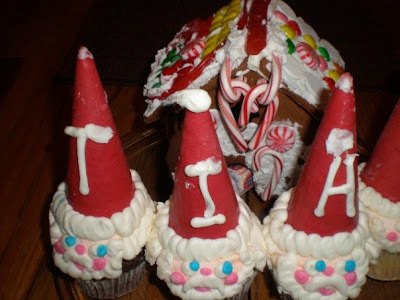 But they all guarded Tia's house with extra care! 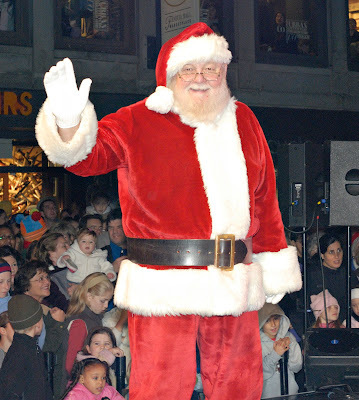 We'll see you at Cheers Faneuil Hall! 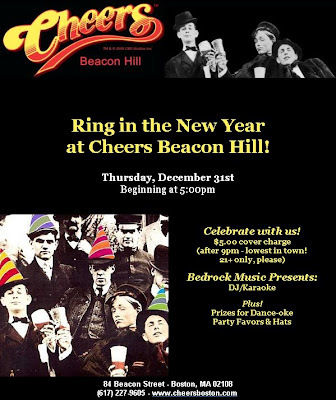 Celebrate New Year's at Cheers Beacon Hill! John Ratzenbuger returns to Cheers! 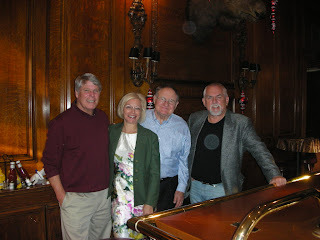 John Ratzenberger, who played mailman Cliff Clavin on Cheers, recently visited the Set Bar for lunch with some old friends. 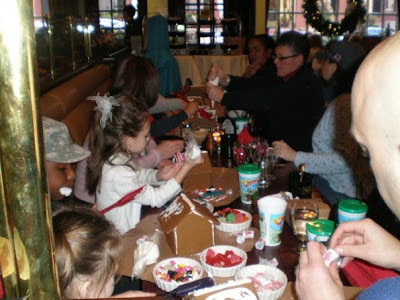 The Hampshire House's Gingerbread Brunch! 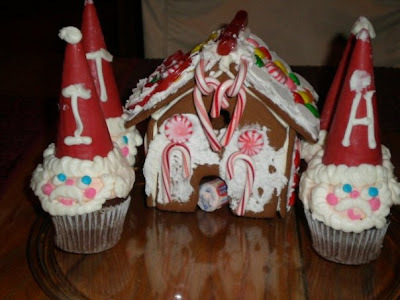 for each receptionist and bags of icing! 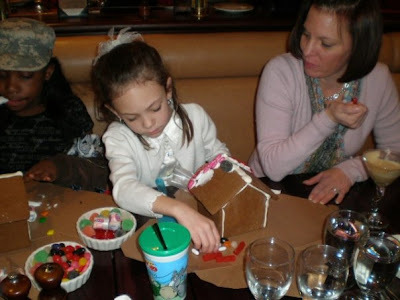 the ladies got to work on their houses. of the Hampshire House, complete with Eric in his Valet coat. 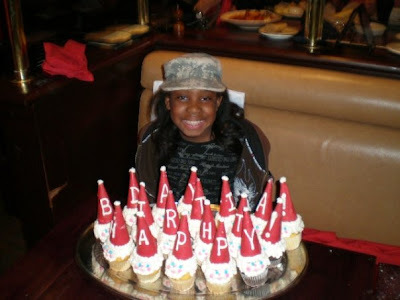 but not until she was done decorating! 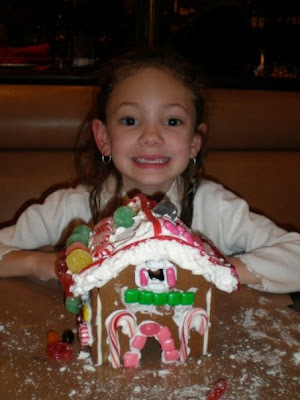 Meanwhile, Sara made a gingerbread cottage inspired by her own home. Well, the apartment number is the same, but the roof might be a little different in real life. 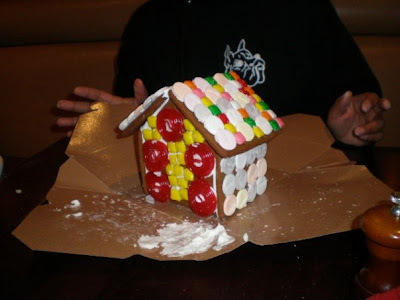 A bit more abstract, Tracy decorated the front of her gingerbread Hampshire House with peppermint stairs, a candy cane front desk, two round candy receptionists checking a yellow Necco coat, and a candy wrapper chandelier. and Good & Plenty for a brick exterior. 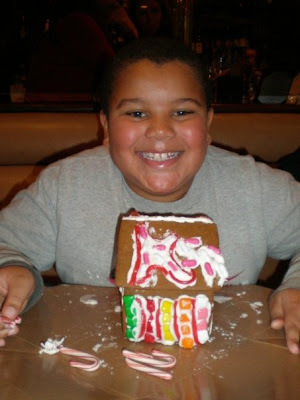 with a hearty patch of candy canes! Three weeks ago, the Anniversary Gala brought friends, neighbors, sponsors, and staff together to celebrate 40 years of Thomas Kershaw's ownership of the Hampshire House, 40 years of the Cheers bar, and 30 years of Cheers for Children. It was only natural that Mr. Kershaw took the stage and express his thanks to all those who have helped the Hampshire House and Cheers thrive for so many years. Tom Babson, now a Beacon Hill resident, played Sam Malone's lawyer on Cheers. 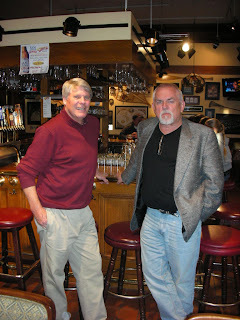 He now visits the pub to sign autographs as fundraiser for Cheers for Children. has worked for the Hampshire House for 26 years. has worked for the Hampshire House for 23 years. has worked for Cheers for 23 years. has worked for Cheers for 22 years. has worked at the restaurant for 20 years. has been an employee for 19 years. has worked for the Hampshire House for 17 years. has been an employee for 16 years. Also honored was Terri Cannady, Vice President of Finance. 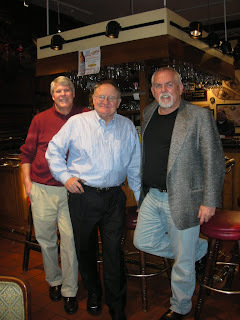 Steve and Bill Honeycutt are also members of the Cheers family. Steve has been our electrician of record for decades. got his start working in Cheers as a teenager. Of course, the staff wanted to honor Mr. Kershaw on 40 successful years of operation! What could be more fitting than 9 liters of champagne and an equally large cake to match? Congratulation! Here's to another 40 years!